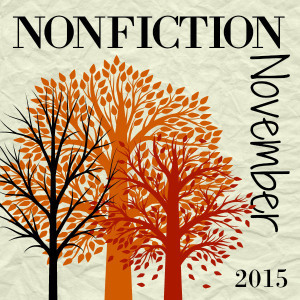 Before Nonfiction November started, I read 32 nonfiction books in 2015. This pleases me. I need fiction like nobody's business, but I want to be perceived as a nonfiction type. I don't know why; perhaps I need a bookworm shrink. The Book of Margery Kempe. I got off to a rocky start in 2015. Tried to read like it was 1439, and I was just... WTF? and...No. A great, gossipy and snoopy biography that sometimes bordered on creepy. The biographer carries around a pair of Patricia Highsmith's Levis! There's a video on YouTube. I cannot judge because I would totally be all over clothing belonging to Katherine Mansfield or Sylvia Plath, given the opportunity. Oh, Marie Kondo. I could not have done that international move without you. Every time I fold an item of clothing, I thank you so hard. So much interesting information, but dull, deadly prose, and all those tables! Reading this book was like kneeling in an ice-cold stream, panning for gold. A fun biography of first cousins Eleanor Roosevelt and Alice Roosevelt Longworth. I am enjoying this trend of saucy biographers. I start every year with the good intention to read more nonfiction than in previous years. And at the end of every year, I've read between 30 and 35 nonfiction books again. Just can't seem to raise the bar at all. I guess we can fit in only so much factual before our brains and bodies rebel. I listened to the audio of Millionaire Next Door. Must of skipped all the charts. Oh wow on that Talented Miss Highsmith. Are you excited about the movie Carol that is coming? oh my - the fashions are to be out of this world. I second the Marie Kondo kudos! My clothes are in the happiest little bundles. Me too, Unruly. I open drawers and smile. Lucky. I wish I had thought of audio.